D'Arcy Spice is an unusual and interesting English apple from the 18th century, grown originally in the area around Tolleshunt d'Arcy in Essex. Although perhaps not the most attractive apple you ever saw, it is valued for its distinctive spicy, aromatic, and fruity flavour, which develops in storage. The flavour is reminiscent of mince pies. D'Arcy Spice is a versatile apple, primarily used for cooking but it can also be eaten after a few months in store, and the unique flavour makes it excellent for juicing. Order now for delivery from 24th April onwards. Please fill in the details below and we will let you know when D'Arcy Spice apple trees are back in stock. Precocity: Slow to start bearing? A notably slow-growing and long-lived variety.? Use / keeping: 3 months or more? D'Arcy Spice is in flowering group 4. D'Arcy Spice is partially self-fertile, but fruiting will be improved if there is a compatible tree of a different variety nearby. D'Arcy Spice has some unusual horticultural qualities which mark it out as quite different from almost all other apple varieties. It makes an interesting subject for the apple enthusiast. It grows very slowly, but it is also long-lived and can continue growing throughout its life, whereas most varieties slow their growth in later years. It seems to have little vigour, and is therefore best grown on a vigorous rootstock. It is a poor pollinator of other varieties and there is some evidence it may not fall into any of the diploid / triploid / tetraploid genetic groups of all other mainstream apples. However it seems to be partially self-fertile, although it would be better to have a pollinator variety nearby - most mid or late-season flowering varieties would be suitable. D'Arcy Spice is quite easy to grow but it is best suited to the drier and sunnier climate of the east and south of England, and benefits from autumn sunshine. Fruiting can be somewhat irregular. The tree is hardy and tough and disease resistant. 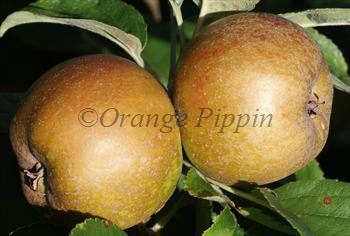 It appears to be tolerant to salty air, a rare quality in apple trees, so is a possible choice for seaside areas. The blossom is tolerant of frost. How tall will this tree grow? D'Arcy Spice was first recorded growing in the village of Tolleshunt d'Arcy in Essex in 1785, and is assumed to have been in the area for some time before that. It was popularised in the 1840s by John Harris, an Essex nurseryman, initially under the name Baddow Pippin - but the original name seems to have stuck.